20 FS Ceramic Beer Stein It Ain't Over Till It's Over, RHINOS PHOREVER, PHANCON 2004 HOLLOMAN AFB, NM. Heavy ceramic, nice collectable. GAF Phantom Pharewell Coffee Mug Dark Blue/ White JG71-R LIMITED QuantityDark Blue Exterior Phantom Pharewell White Interior with JG71-R, Dated Interior . Insignia Printed in Gold, Dishwasher Proof / High Quality. Coffee Mug - GermanAirFoce JG-71 Closing "SPOOK"
Dark Blue/ White JG71-R LIMITED QuantityDark Blue Exterior EngravedPhantom Pharewell "SPOOK"White Interior Engraved; "I Report Off Duty" in GermanDishwasher Proof / High Quality. F-4 Phantom II 60th Anniversary PatchThis patch commemorates the 60th Anniversary of the F-4 Phantom II. The design recognizes the 12 World Countries that either flew, or are still flying, the F-4 Phantom II aircraft since initial service entry with the United States.4" tall by 4" wide. Extremely High Quality, Fully Embroidered and Made In The USA by Shelby Patch Company, Shelby, Michigan. 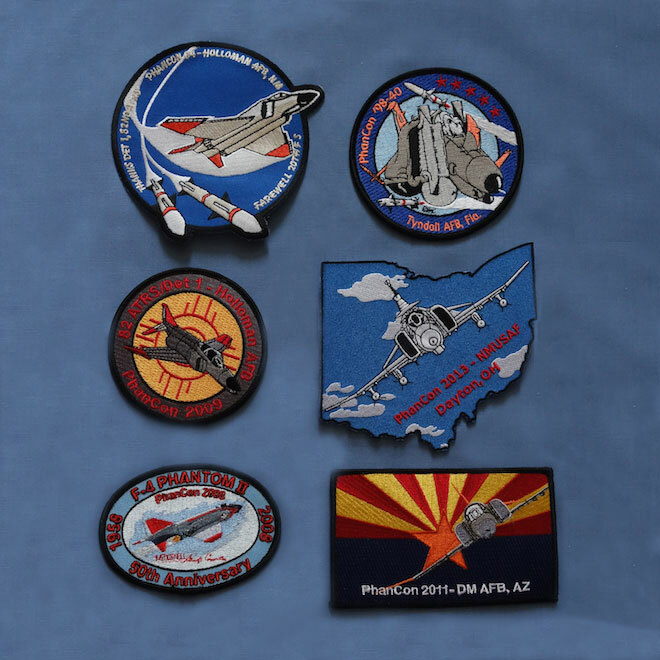 Phantom Phinal Plight PatchLIMITED EDITION.This patch commemorates the F-4 Phantom II Phinal Phlight in the United States. Designed by the former F-4 Phantom II Society Store Manager, Paul Kuzinski.4" tall by 4" wide. Extremely High Quality and Made In The USA by Shelby Patch Company, Shelby, Michigan. Very nice high quality 50 year patch created by Joe Sepanik (JLM Embroidery Palm Desert CA) and donated to the Society.